Another awesome article from our clients on the topic of visual inspection of printed circuit boards using Altami products. I work as an expert in the State expert centre in St. Petersburg. One of the new directions of expert duty of my division is radio-technical expertise which is examination of radio electronic devices. To support the framework on visual inspection of electronic devices according the state order, a set of equipment was purchased, which includes a number of Altami products (stereo microscope, microscope tripod for the study of large objects, ring illuminator, fiber optic illuminator, digital camera for microscope). Altami Studio software to control above listed equipment was also purchased. We were pleased with the quality of the equipment supplied by Altami company. All adjustments, component seats, clamping mechanisms, etc., in other words all parts of the equipment did not cause even the slightest complaints. The microscope was equipped with two illuminators: one is on the bottom, creating a light spot to the lumen of the object glass; the other is on top, forming a slanting light spot. These illuminators can be switched ON together or separately. Both illuminators have smooth brightness control by dimmer. In some case the ring led illuminator is required to use, which is mounted on the microscope lens. The ring illuminator also has the dimmer for smooth brightness control. After installing Altami Studio software and digital camera driver its connection to PC using the USB port did not cause any difficulties. The image on the computer screen allows to inspect objects in real time with excellent quality. This application makes it easy to document visual features of objects using a powerful set of image filters. After studying the features and tools of Altami Studio it became clear that in the process of inspection of printed circuit boards panoramic photography feature will be the principal one. This tool allows you to automate the process of merging of multiple image fragments of one large object, if there is an overlap of pictures relative to each other. 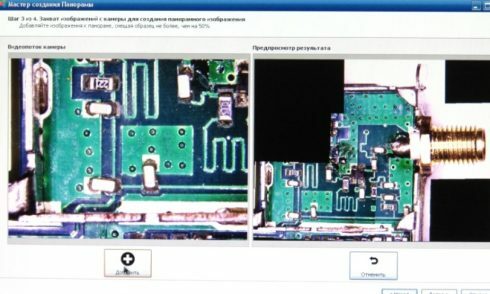 The Panorama tool in Altami Studio greatly facilitates the inspection and documentation of printed circuit boards defects, and allows to obtain more confident conclusions about them and to provide objective visual evidence. Below is an example of a panoramic photo, automatically created by Altami Studio from five images fragments. During radio technical expertise the expert often checks for presence of some artisanal manufacturing methods for electronic board or its elements, or the presence of some modifications made by artisanal methods. In this case, photographing using the microscope, digital camera and Altami Studio software allows to document the presence of this kind. Here, for example, is the case of an electronic device in which various components are mounted. In a particular case it is working surface of the electromagnetic head adapted for reading information from magnetic strip of plastic payment cards. Here, even with a small increase it is clearly visible irregularities surface treatment inherent in manual processing. Detailed enlarged images show the condition of the electromagnetic coil of the specified head and the quality of the ferrite core and its gap used as the working surface of the electromagnetic head. The scale bar and the measurement of segments with footnotes on top of the photo are also useful tools that demonstrates the actual dimensions (after calibration). One of the useful properties of Altami Studio software is the ability to produce video. This allows to simplify the preparation of training materials on new methods of inspection of electronic devices, improve skills of expert centre personnel and train young experts and newly hired employees. Operation of Altami equipment and software brings a real pleasure of work with them. Its quality confirms the correctness of the choice of the name for Tool Set at our engineering laboratory, which is called as “Pleasure”.